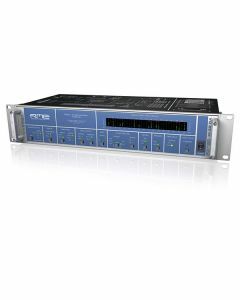 RME's M-32DA is a 32-channel high-end DA converter, easy to operate yet having a comprehensive feature set. The unit combines excellent analog circuit design with the latest converter chips and RME's superior SteadyClock, resulting in a state-of-the-art DA conversion - not less than 32 times! The M-series converters have been conceived and optimised for professional studio, stage, and broadcast applications. Combinations of the M-16 DA and M-32 DA converters allow for setups with 16, 32, 48, or 64 channels, according to your individual application or budget. The unit's unique set of features includes three hardware reference levels up to +24 dBu, MADI I/O and ADAT input up to 192 kHz, 6.3mm TRS and D-sub outputs, remote control via MIDI, and operation across a wide range of mains voltages, all packed into a 2U enclosure.